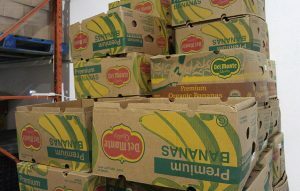 Did you know we have banana boxes available to farmers for bulk purchase – 30 cents a box, 72 Boxes per skid. These sturdy cardboard boxes are great for packing produce of all kinds and fruits such as apples and pears. Farmers wishing to bulk purchase banana boxes can call Lisa S, our Logistics Manager at 604-581-5443, loc.105 to arrange for pickup. The Surrey Food Bank supports 250 families a day. And we are so glad to be able to give fresh produce to all our clients. Farmers and large food producers wishing to donate fresh produce are also encouraged to call Lisa S, our Logistics Manager at 604-581-5443, loc.105 to either arrange for pickup or your delivery of a donation to our depot.